Kim and I have finished the first stage of our journey — the “see lots of family and friends” stage — and have moved on to the next phase of our year-long RV trip across the United States. For the first forty days of our trip, we ate a lot of good food, drank a lot of good wine, and talked with a lot of good people. We weren’t able to establish any kind of routine, though. Now we can change that. We hope to exercise more, spend less, eat and drink better, and find time to share more of our adventures. This morning, for instance, we woke in Arizona’s awe-inspiring Verde Valley, which is nestled at the edge of the Colorado Plateau more than 100 miles north of Phoenix. Sedona and Flagstaff are just a stone’s throw away, but before we go see them, we want to tell you about how we’ve spent our past week. Last Tuesday, we pulled up roots in Palm Springs and drove across the desert to Phoenix, Arizona. After spending the night in a casino parking lot, we headed south to Tucson (which I’ve taken to calling “tuck-sun” so that I remember to spell it correctly). There we enjoyed the generosity of Kim’s Uncle Dan and Aunt Lynda, who set us up in their guest quarters. 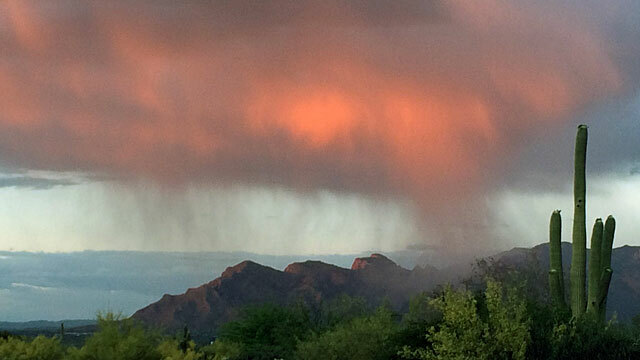 It’s split in two by the city of Tucson. It’s small, drivable in minutes. It’s home to the country’s largest cacti (or “cactuses”, if you prefer). Kim was fascinated by the giant saguaros, which can live for more than 150 years. These plants face harsh odds in a harsh environment, but those that survive can grow to be fifty feet tall (with weights measured in tons). We also took a stroll through downtown Tucson, stopping for lunch at Cafe Poca Cosa and mediocre beer at the Portland-esque Proper. 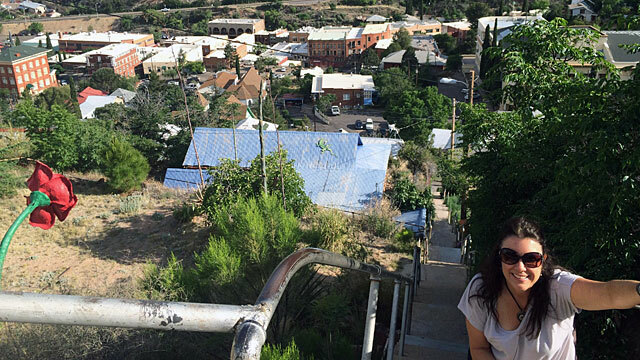 Bisbee is a small town (just over 5000 residents) tucked into the Mule Mountains of southern Arizona. 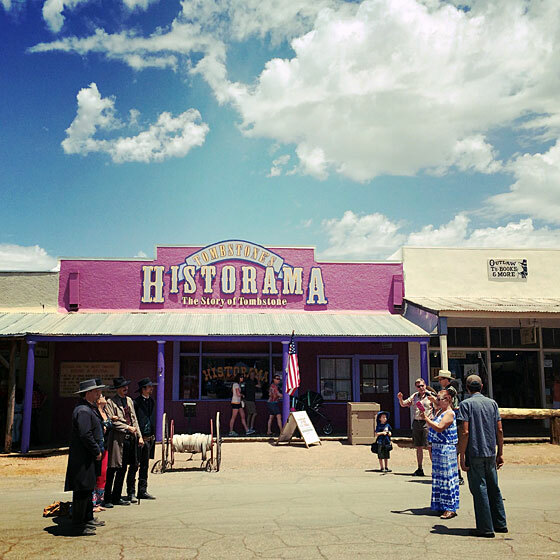 It was founded as a mining town in 1880, and mining was the core of its existence for almost one hundred years. But the mines all closed during the 1970s, which caused a seismic shift in the area’s demographics. Because the town is nestled in a canyon, streets are narrow (often two-way traffic with one-way width) and homes cling to hillsides. Residents use a network of staircases to get around. There are so many steps, in fact, that each fall the town holds a race called the Bisbee 1000: 4.2 miles and 1034 steps at 5538 feet of elevation. Yikes. Kim and I had a great time in Bisbee. We drank mediocre beer at local bars and breweries (from our experience, Arizona just doesn’t make good beer), took a golf car tour of the town from a native, browsed the art galleries, watched the Kentucky Derby (which we’ve managed to do all four years we’ve been together), and ate a fine dinner at Cafe Roka. In the evening, we returned to the Calumet and Arizona Guest House, where we sat outside and watched the stars. Note: One of the highlights to our day was watching Terry Wolf and her trio perform at the Copper Queen Hotel. This gal has talent! We thought she had a terrific voice, and enjoyed her take on songs like “Hotel California” and “Blue Bayou”. We loved the Calumet and Arizona Guest House, and not just because it was our first hotel stay of this trip. This bed and breakfast is run by Joy Timbers, who has decorated the 111-year-old Victorian home with antiques and family heirlooms. The place is huge but homey. She and her husband have also purchased the lot next door, which has allowed them to add a detached apartment and a lovely terrace. We stayed upstairs in the enormous Beige Room, and we’d do it again in a heartbeat. On Sunday morning, Joy served breakfast to us and the other guests. 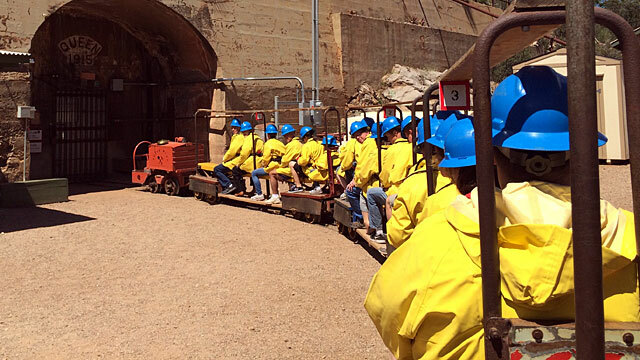 Afterward, Kim and I took a tour of the Copper Queen Mine. The excursion was entertaining, inexpensive, and informative — a great combination. Because both of us love to drive, we took the long way back to Tucson. We dropped out of the mountains to Sierra Vista, then cut west to Patagonia (a small town that looks like it ought to be in Oregon, not Arizona). The highway turned south to Nogales, which brought us within a mile of the Mexican border, then we turned north for Tucson. After stopping for lunch (and window shopping) in Tubac, we returned to Dan and Lynda’s for a final evening of wine and conversation. Southern Arizona was beautiful, especially its riparian zones. So far, northern Arizona is even more so, and I’ve only seen a tiny portion. Today, we’ll begin exploring the area around Sedona and Flagstaff. Later this week, we’ll take a trip to the Grand Canyon. And in the weeks to come, we’ll head north to the Four Corners region, and then move east to the Rocky Mountains. And, as I mentioned earlier, we hope to begin establishing routines, making time for fitness, batch cooking meals for the week, and finding time to write. After six weeks, we love life on the road. “I could do this for the rest of my life,” Kim said the other day, and I agree. In order to make that happen, however, we need to find a source of income. We can afford to do this for a year or so, but after that we need to make money while we travel. How will we do that? You’ll find out when we do! Chino Bandito! YUM! :) I’m interested in your experience in Sedona. I LOVED it, but I was there in the lowest of low seasons, so I imagine your experience will be very different. Find a vortex! The Desert Museum is one of my favorite places to visit. If I were to be a snowbird, the Tucson area would be my choice. Sierra Vista is a fun place to visit if you’re into birding. The Nature Conservancy has land there that’s wonderful for spotting all sorts of birds. We spent a night in Flagstaff when my sister and I were RVing, but didn’t get to see much of the town. I look forward to hearing your impressions and seeing your photos. And, hey, the North Rim of the Grand Canyon is awesome! Ahh, yes, we’ve heard the North rim is a very worthwhile stop too! Loving Az more than we thought we would. I’m a bit late to think of this (and haven’t read all your posts word for word, so perhaps you’ve mentioned this already), but I hope you bought the National Parks annual pass at the start of your trip. Looking forward to the rest of your adventures. We did, and it has payed for itself several times over.